This is the most northerly region of Italy, in the heart of the Alpine circle. The South Tyrols are in fact a Germanic-Italian region, with Alto Adige having only been made part of Italy following the 1st World War after being ceded by Austria. The end result? A region that seems almost as Teutonic as Germany in some places, with German language signs and menus a common sight. Trentino is a mainly mountainous province, rich in rivers, torrents and numerous lakes, clusters and chains of mountains of singular beauty, divided in two by the valley of the river Adige, so whatever nationality it chooses to be there is now denying the beauty of the region. To the west one finds the glaciers of the group Adamello-Presanella-Care Alto and the group of Brenta. To the east the groups of Lagorai, Latemar, the Dolomites of Fassa, and the Pale di S. Martino. Many alpine valleys break away from the valley of Adige: the Valsugana, the Vallarsa, the Val di Non, the Val di Sole, the Val di Cembra, Fiemme and Fassa; inside instead the valley Giudicarie and Rendena. The principle lakes are those of Garda, Caldonazzo, Tovel and Ledro; thermal waters gush forth from springs rich in therapeutic properties. Extensive coniferous forests cover the dolomitic slopes and wide tablelands like those of Folgaria, Lavarone and Pine. 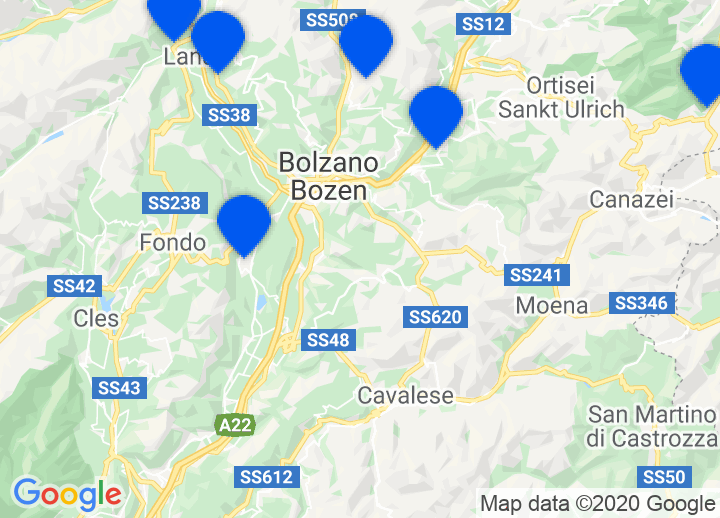 Choose from our boutique and romantic rentino Alto Adige hotels and accommodation by clicking on the map or list on the right. These will highlight a wide selection of boutique SouthTyrol hotels, including romantic Meran hotels, rural retreats, bed & breakfasts, Dolomiti hotels amongst others. Whatever your taste, we’ll help you find that perfect getaway.